1. 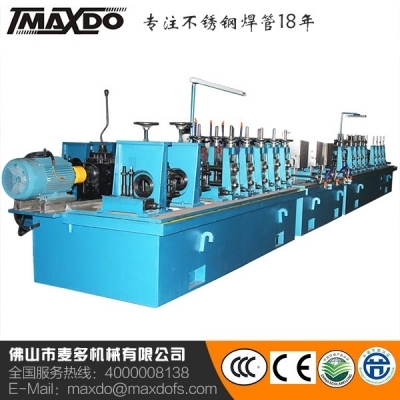 Stainless steel decorative pipe machine Stainless steel decorative pipe machine is mainly used for the production of stainless steel pipes and carbon pipes for decoration, products, household appliances. After the moulding of this series of machine sets, round pipes, square pipes and rectangular pipes can be drawn out. It can also produce elliptical pipes, semi-circular pipes, plum blossom pipes and other special-shaped pipes. Such as: stainless steel staircase handrails, burglar proof doors and windows, electric heating pipes, etc. 2. Automated production process: continuous forming process and knot through uncoiling, feeding direction, marking, forming, welding, external weld grinding, shaping and sizing, sizing, cutting (coil), jointing, etc. Stainless steel decorative pipe machine is mainly used for the production of stainless steel pipes and carbon steel pipes for decoration, products and household appliances. After the moulding of this series of units, round pipes, square pipes and rectangular pipes can be drawn out. It can also produce elliptical pipes, semi-circular pipes, plum blossom pipes and other special-shaped pipes. Such as: stainless steel staircase handrails, burglar proof doors and windows, electric heating pipes, etc. Through the continuous forming process of uncoiling, feeding guidance, marking, forming, welding, external weld grinding, shaping and sizing, sizing, cutting (coil), jointing, etc., the structure is fine and the operation is simple. 3. Product characteristics: the machine is strong, durable, high precision, fully automated, simple to operate, continuous production, high efficiency, less waste of materials, high yield, low production cost. 1, ensure smooth production and meet product requirements. 1.2 effective maintenance of equipment. 1.3, write reasonable operation instruction procedures to ensure the production plan and product quality achieve the desired goals. 3.1 ensure the effective cleaning of equipment and record of cleanliness during shift. 3.2 accurately control the operation of the machine before shift and coordinate with normal production. Pay attention to the opening of water, gas or electricity, grinding the wheel, saw blade and cutting table. 4 before starting, according to the lubrication requirements, injecting different lubricants to the parts where the lubricating oil is required to be injected. 4.1 first check whether the electrical switches are in the 0 position, then turn on the power supply. 4.2 Check whether the mechanical parts and pneumatic system are normal or not. If there are abnormal phenomena, they should be checked and eliminated in time so as not to cause mechanical equipment accidents. 4.3 Check the transmission gear is correct, otherwise there will be quality problems, whether the pressure gauge of the cutting machine reaches 0.5-0.7 mpa, otherwise it can not be cut. 4.4 Let the motor run empty for 2-3 minutes before going to work every morning. The transmission gears are equal to 0. When driving, the operator is not allowed to leave the machine tool and do other irrelevant things. 4.5 it is strictly prohibited to wear gloves to boot, long sleeved clothes must wear hand sleeves, and long hair must wear a hat. 4.6 do not wipe the rotating parts when starting. 4.7 correctly adjust the mold, not vigorously under pressure, in place. 4.8 during the operation, you are not allowed to leave the machine tool. You are not allowed to do other irrelevant things, and pay attention to whether the welds are normal. 4.9 In the process of pipe-making, the cutting strip must be consented by the workshop director, stored in the belt-laying area, and recorded in detail with the sling operator on the Production Process Card. It must not be discarded at will. 4.10 If abnormal phenomena are found in operation, such as smoke, burning odor, sudden fuse burning, sudden extinguishment of indicator lights and timely switching off the power switch to be checked out, then turn on operation after troubleshooting. 4.11 the product's length is checked regularly, not more than 6.01 meters, not less than 6 meters. Strictly controlled between 4mm. The pipe on the unloading pipe rack should not exceed 95% of the total capacity, so that the flat mouth personnel should be lifted in time, otherwise the operator will be responsible for the damage. 5.1 stop welding while closing the power supply.